The average North American consumes over 10 hours of media per day! With so much branded content and so many logos, ads, and slogans popping up every day, it can be challenging to differentiate yourself from the masses. Nonprofits have the added challenge of promoting a cause or movement, which is often less easily understood as a tangible product. For this reason, consistent branding is an essential part of making your mission stick in your viewers’ minds. Control your organization’s message. If you’re not well branded, it’s likely your mission is more susceptible to misinterpretation. If you’ve ever heard the question, “So what exactly is your organization about?” then it’s probably time to brand (or rebrand) your nonprofit. When done correctly, branding can help you effectively communicate your mission and goals and control how your organization is perceived by an audience. Spread your message and attract a wider audience. From your logo design to developing your voice—telling your story through branding is a way to appeal to the masses clearly, increase brand awareness and reach new, prospective donors. Establish trust and reliability. It’s important to establish your organization as trustworthy. 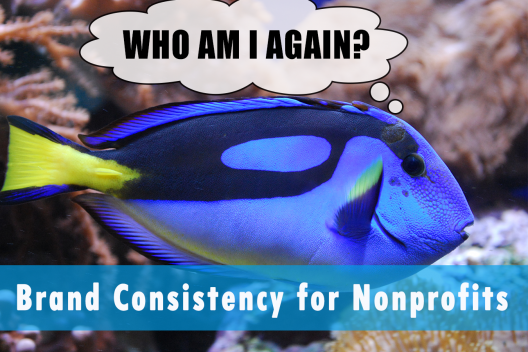 Nonprofits with inconsistent branding can seem unpredictable and unreliable. Your audience will be more likely to donate or help spread the word if they are confident in what to expect and see that you are making a positive impact. Stand out from the crowd. Your nonprofit is likely one of many groups serving a similar cause. While it’s wonderful to have multiple organizations engaged in social issues, this creates competition for donors, grants, and other supportive resources. Utilize your branding to show how your organization is different from the rest. Ask yourself, how is your method of approaching a problem unique? What goals are you pursuing that others are not? Differentiation is all about giving people a reason to remember you over others! Cross platforms and mediums. Once you have created some brand guidelines and established your nonprofit’s identify, you can confidently cross into multiple marketing venues. From blogs, email marketing, social media campaigns, fundraising events, online advertising— your nonprofit can build a consistent presence across all these mediums in order to effectively communicate with your audience. Need help understanding the public relations process and how to adapt it to your organization? Contact us today for a no-obligation consultation. Public Relations, Press Events, Special Events, Storytelling, Digital Marketing … we can help you implement a strategy for engagement and growth.